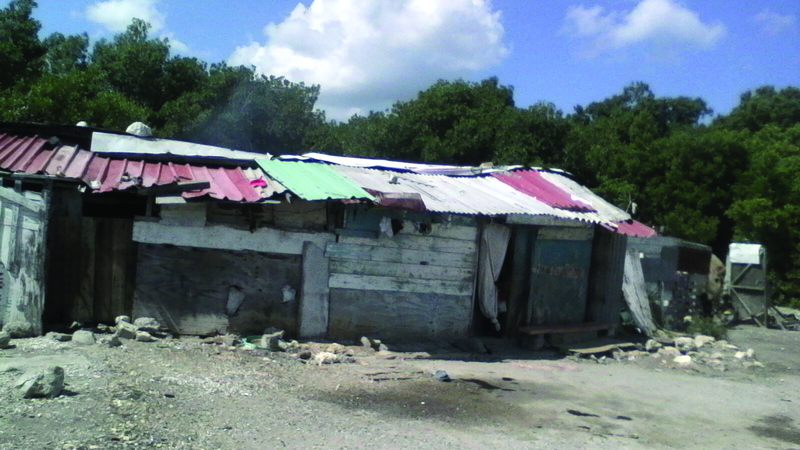 Two squatter families share this isolated shack on the edge of a swamp in Portmore, Jamaica. 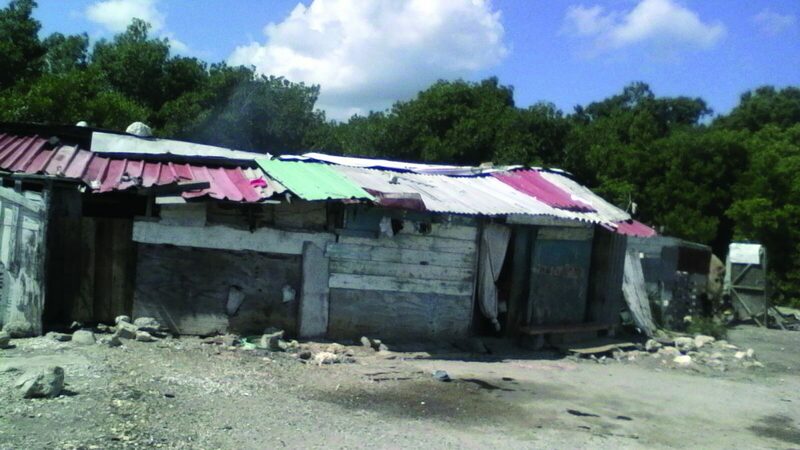 Andre Johnstone (Kingston) was bringing a monthly supply of food to a shack occupied by two families of squatters when he spotted a small boy of about six and his smaller brother walking by the road. The smaller child had tears in his eyes. When Andre stopped the car, the larger boy explained that their house was burning. Andre drove quickly to the shack, a wide structure built from plywood scraps and faded wooden signs for a beauty salon. He recognized it as the house where he was supposed to be delivering the food. “I could see flames in the roof,” he recalled. The roof was a mixture of corrugated zinc panels and cardboard, with the pieces held in place by large rocks. Inside the dark shack, Andre found the place where the ceiling was burning and saw a piece of cardboard hanging down, also in flames. An electrical wire dangled from the ceiling, charred and blackened. He grabbed a bedsheet and began waving it, but fanning only made the fire grow stronger, so he pulled down the piece of cardboard and flung it outside. There, one of the children told him to look for a water bottle on a table—the shack had no running water. Back inside, Andre felt around for the bottle, grabbed it and used it to extinguish the flames in a roof beam along with the embers that had fallen onto the floor. “There was just enough water to put out the fire,” he said. With the fire quenched, Andre took the children to their mother, who was in a nearby bar. She said she had left them with an uncle, but he was nowhere to be found. Thanks be to God, and thank you, Andre, for not letting fear rule, but only love and compassion for the Lord's people. What an amazing story, Andre. You were right where the Lord wanted you so you could help. Praise God!